Skiing is a 1947 oil painting by folk artist Ladis W. Sabo (1870–1953). Born in Budapest, Sabo immigrated to the U.S. in 1910 and traveled the country, settling in New York City in 1942. A tailor by trade, he taught himself to paint at age 74. (Source: ArtPrice.com). Image courtesy Beekley International Collection of Skiing Art and Literature. Before he found fame as a filmmaker, Warren Miller spent the winter of 1947 living the ski-bum life in a parking lot in Sun Valley. An excerpt from his autobiography, Freedom Found. How Bob Parker helped to build Beaver Creek; funding ideas and foreign athletes in U.S. collegiate racing. 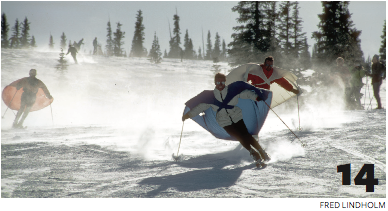 Herman Gollner’s innovative slalom pole; the evolution of the wind-chill index; Lowell Thomas and two McConkeys in one vintage snapshot. Plus: Ski-poster artist Carl Moos. From male migration to gender revolution (1974); a 65- foot leap over a line of cars (1940); the degeneration of Davos (1882). 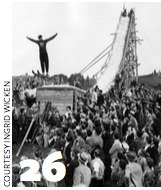 New books on California ski jumping and the Laurentians of Quebec; plus a collection of lyrical essays and articles by Peter Shelton. ISHA and NASTAR to host Skiing History Days in March 2018 at Squaw Valley Alpine Meadows; Olympic and World Championship medalist Christin Cooper joins ISHA’s Presidential Circle as fall fundraising campaign chair. U.S. Ski and Snowboard Hall of Fame announces its Class of 2017 and April 2018 induction banquet. Farewell to ski pioneers Bob Cram, Armando Trovati, Clay Freeman and Jack Valentine. In 1966, you could buy a head-to-toe ski outfit with S&H Green Stamps. Are you a current ISHA member? If you are currently a member and receiving Skiing History print edition and would like get FREE access to the digital version, please request access to digital membership. Not an ISHA member yet? If you would like to access our digital subscription, please visit our membership page.